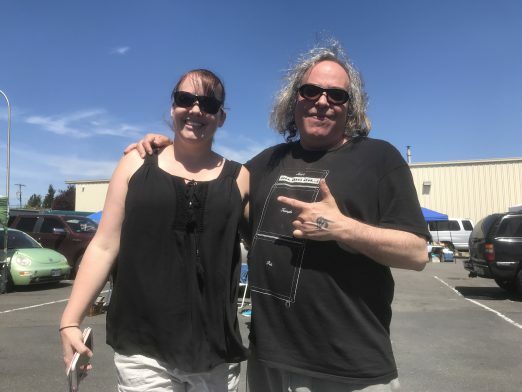 September 2nd, 2018 Tracy Posted in White Center Chamber of Commerce, White Center news Comments Off on White Center ‘End of Summer’ flea market – want to be a seller? Beautiful day to shop outdoors! 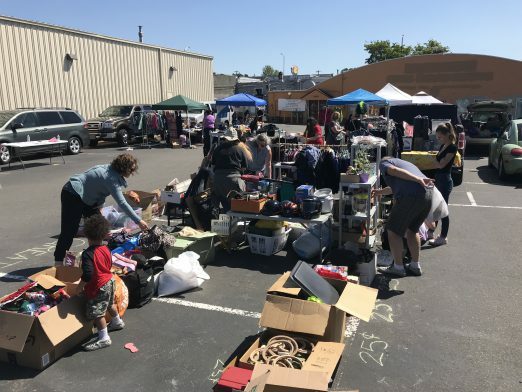 If you read our partner site West Seattle Blog, you probably know that WSB presents West Seattle Community Garage Sale Day every year, and there are usually at least a few White Center participants. This year, the revitalized White Center Chamber of Commerce is presenting a flea market that same day, Saturday, May 12th, and it’s one of the stops on the WSCGSD map. 10 am-2 pm next Saturday, businesses (brick and mortar AND direct sale are welcome) and community members are invited to participate by setting up in the parking lot at 9834 17th Ave SW. Sale hours for that site will be 10 am-2 pm. Meantime, check out the full WSCGSD map – clickable and printable versions – here. The White Center Chamber of Commerce‘s battle against graffiti/tagging vandalism is still getting off the ground. 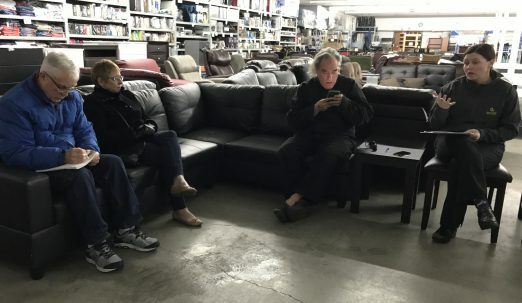 This past Monday night, about a dozen Chamber members and community advocates gathered again at Northmart to talk about it, two months after the previous meeting (WCN coverage here). Dr. Kathleen Paulson from Cascade Heights Veterinary Clinic (9832 15th SW) led the meeting. Her clinic has forms that residents and business owners can use to identify graffiti vandalism and take to McLendon Hardware (10210 16th SW) to get the Chamber-arranged discount on paint and other supplies to get rid of it. The Chamber also is working to find a go-to person who can be contacted directly to go paint out vandalism when it’s reported, and to locate a storage area for paint and supplies that person will be able to deploy. 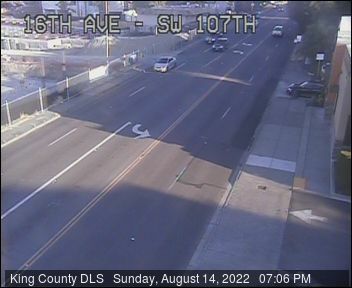 As for current trouble spots, the alley east of the east side of the heart of 16th, between Roxbury and SW 98th, was mentioned by several attendees. Open house at Sky’s Barber Shop in the business district. 9650 16th Ave SW, today, Thursday, January 28, 2016 – starts at 6 pm, ends around 10 pm. Food, drinks, and getting to know each other. The chamber has been inactive for some time and is revitalized and working diligently to reconnect with the community of White Center. 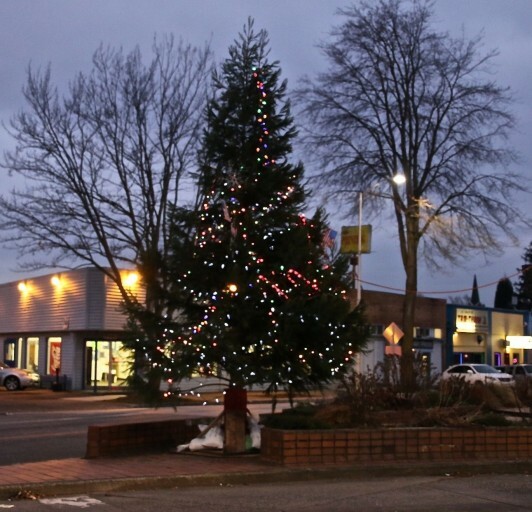 Mac’s Triangle Pub, right next to the official White Center Christmas tree at 16th/Delridge/Roxbury, is one of the places you’re invited to gather tomorrow with the White Center Chamber of Commerce. 6 pm is the evening mixer there, or if lunchtime works better for you, join the WC C of C at the Technology Access Foundation building at Lakewood Park, 605 SW 108th, at noon. Join us for lunch or dinner to discuss issues concerning the White Center business community. Got something to discuss or share for the next meeting? Can’t make it Tuesday? Join us for happy hour on Friday! Come join us for BOSS Happy Hour!! Meet other business owners, mingle with the neighborhood, and stay for Salsa dancing! Lessons and music start at 9 p.m.
Join us Tuesday for a Power Lunch, noon-1:30 pm, at 3.14 Bakery. The day’s topic of spring cleaning will be addressed by Alan Painter and Bong Santo Domingo of King County Community Services, and Marquise Roberson of WC Community Development Association. Learn how to propose a project for the upcoming Spring Cleans and how to fund a small community project through King County’s Community Service Area grant. 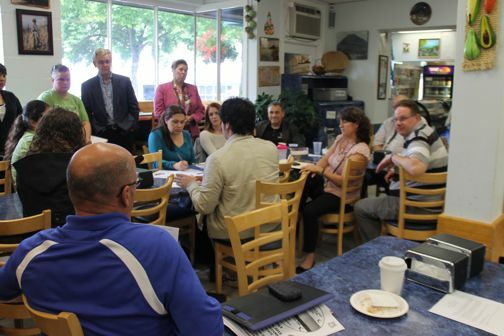 Did you know every second Tuesday, WC Chamber of Commerce hosts a luncheon? Join us! Our March 12th luncheon will be held at WC Chamber Vice President (Mac McElroy)’s Mac’s Triangle Pub on 16th and Roxbury, noon-1:15 pm. We have an outstanding line-up of guest speakers: Honorable King County Councilmember Joe McDermott and Highline School Distict Superintendent Dr. Susan Enfield. 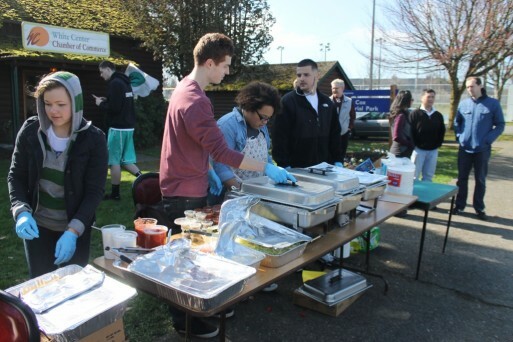 Happening now in front of the White Center Chamber of Commerce – volunteers are serving lunch as part of the first-ever monthly “White Center Friday Free Lunch in the Park,” with food courtesy of Taco Time Northwest. More details in the announcement we published earlier this week. To find the White Center murals, follow the map on the Chamber’s website. New page launched for the White Center Chamber of Commerce just hours ago, to complement their new website. You can add the FB page to your “likes” list – just go here. White Center Chamber of Commerce lunch: Tomorrow! October 8th, 2012 Tracy Posted in White Center Chamber of Commerce, White Center news Comments Off on White Center Chamber of Commerce lunch: Tomorrow! The White Center Chamber of Commerce will have its monthly Chamber luncheon meeting tomorrow (always the second Tuesday of the month except in December), Tuesday, October 9, 2012, from 12-1:15 at Chemo’s Fine Mexican Restaurant, located at 10230 16th Ave. SW.
W.C. Chamber of Commerce proudly invites you to attend our first-ever summer luncheon on Tuesday, July 17th, noon-1:30 pm, at Mac’s Triangle Pub, 9454 Delridge Way SW, for a lively discussion of current events, announcements, and resolutions. Please join us and share this information with those who care to learn about and become involved with our vibrant community. We look forward to your presence! P.S. A drawing of prizes will occur at the end of the meeting’s agenda. Prizes welcome — bring your coveted items and gift certificates to add a little fun and excitement! 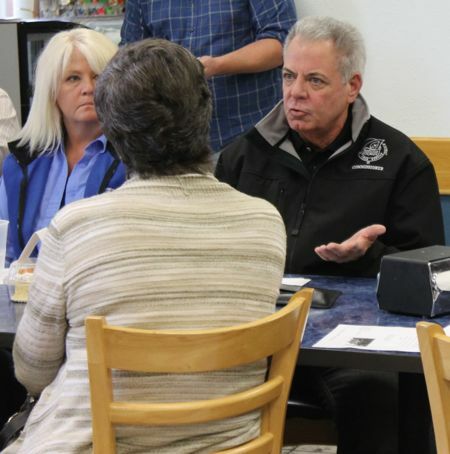 “The monthly Chamber luncheon’s been happening for over 60 years … but I don’t think we’ve had this many people in a long time,” White Center Chamber of Commerce president Mark Ufkes said as today’s lunch began at Salvadorean Bakery, with more than 40 people on hand. Before opinions were sought, there was a long preface. Trujillo said “visitratcity.com” was an “alternate domain name” they had set aside, but the main domain name “will be visitwhitecenter.com.” She talked about the vitality of the new businesses coming into the area, and people using “hey, c’mon up to Rat City … it’s not always come up to White Center.” She said the “kick it in Rat City” that’s currently on the main page is something that will frequently change up. Designer Wheeler then spoke about their efforts to “look at all the aspects of White Center,” including history and “reclaiming the rat a little bit – it’s not about rats eating out of garbage cans, but about the regional military training” in the area. She too talked about the “hip” new businesses. 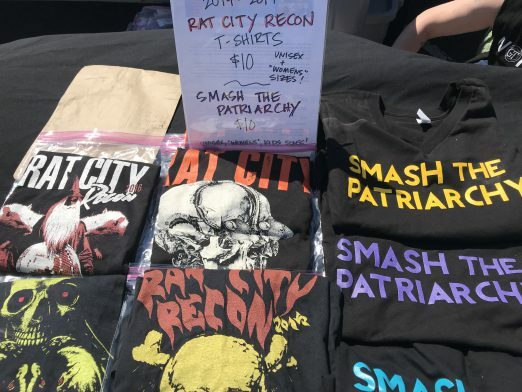 “We’re not trying to push anybody or anything out.” The rat on the website front page, she said, was inspired by the “Asian Year of the Rat,” and they’re hoping that perhaps when the “Year of the Rat” really arrives (the next one is in 2020), there might be a big party. Seventy businesses have been photographed for the website already, she said, and only a few have opted out. According to Wheeler, the goal is for the website to be at least partly launched by Jubilee Days – not the business directory but the rest of it – with the rest to go live by the end of summer. 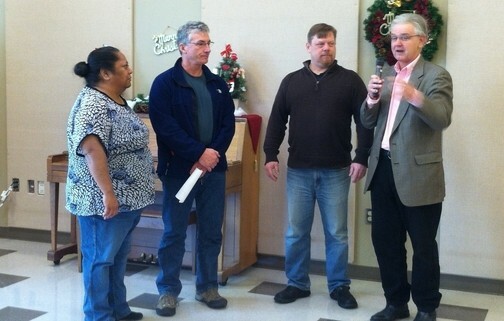 Chamber vice president “Mac” McElroy then noted that the goal of this is to bring people together. One prominent voice of Rat City support chimed in then. “This IS Rat City; we’re not going to change it into Wallingford,” said Justin Cline, Full Tilt Ice Cream entrepreneur and Rat City Business Association co-founder, followed by Jesse Lovell of Company, another co-founder, who said “this came together pretty organically because we (business people in downtown WC) see a lot of each other, check in with each other and it came to be based on those organizations.” They have a website which includes “Ratty,” its mascot. Website designer Wheeler pointed out that the RAT acronym has a military origin. Ufkes noted that the rat’s been on a banner “flapping in the wind,” for more than a year. Former Chamber president and NHUAC president Russ Pritchard said he was speaking on behalf of past Chambers: “We spent tons and tons and tons of time over the years trying to change the Rat City image,” he recalled. “… Now I’m not so involved in this area any more, but when I tell people I’m from this area, they say, ‘Oh, you’re from Rat City’.” He said his main advice was to do a better job – which he said he and his colleagues had NOT done long ago – about what RAT really stands for. Frank Cantwell of Holy Family School said his informal polling was reinforcing the generation gap. “If it’s done right, go with it,” he said a friend had told him, and he agreed. Another opinion: The rat image is “cool … I’d like it on a T-shirt .. .but everytime I run into someone, I have to explain ‘Rat City,’ and if you have to explain it, that’s not such great branding.” She noted that even the Rat City Rollergirls’ name had to be explained, when she was a Seattle-area newcomer some time back. “I also love the ‘not so centered, not so white’ (White Center slogan),” she noted, leading to a ripple of laughter through the room. P.S. If you are a Chamber member, you are invited to get involved in the website committee. KING COUNTY P-A-L IN THE SPOTLIGHT: Head coach Tony Rago from King County Police Activities League‘s White Center boxing club (a member of USA Boxing), based in White Center for eight years, talked about his program, saying about 40 kids (generally between 10-18 years old) are involved right now – not just to box, but to get “physically fit and mentally fit” and to “provide a safe place (to be) after school.” Some kids first show up “so quiet and shy … you didn’t even know they were there,” and blossom as part of the program, which is for girls as well as boys, he pointed out. And he ticked off a variety of honors – including trophies for the boxers, and “Best Boxing Gym” honors from Seattle Weekly last year. He says they live by three mottos: “Leave No Doubt”; “Box to the Bell”; “Take It Like a Man” – whether you’ve won or lost, be gracious, be determined, “keep coming back.” He says they have a show coming up on August 25th at the Evergreen Campus, one of several they present each year. They’re accepting sponsors for the bouts, too (tax-exempt donations).